Processor Expert is great: it generates initialization code and driver sources for me. This makes it a great knowledge and source base for non-Processor Expert projects too. Wondering how to initialize the SCI? What are again the register settings to use the CPU with a 6 MHz clock rate using an external crystal in low power mode? Lets generate a Processor Expert project to find out. Then copy-past the drivers or parts of it into my non-Processor Expert project. But How to do this? I present here two different things: sneaking just a driver or a part of it, or sneaking the Processor Expert project as a whole. The first thing is more complicated and requires knowledge about the different parts of the generated code. I say ‘typically’, as a component can create more than just the header file and the implementation file, see the FreeRTOS component as example. So I can simply copy the implementation file and the header file to my non-Processor Expert project. Very likely the implementation file will include as well other file like Cpu.h, which includes PE_Types.h, PE_Error.h, PE_Const.h and IO_Map.h. The easiest way is to copy these files too, but this might not ideal. The hard way is to analyze the implementation module and just add what I need. This typically sets up the CPU clock: so if I’m interested in this part, this is what I was looking for. Processor Expert adds them by default into Events.c and Events.h. 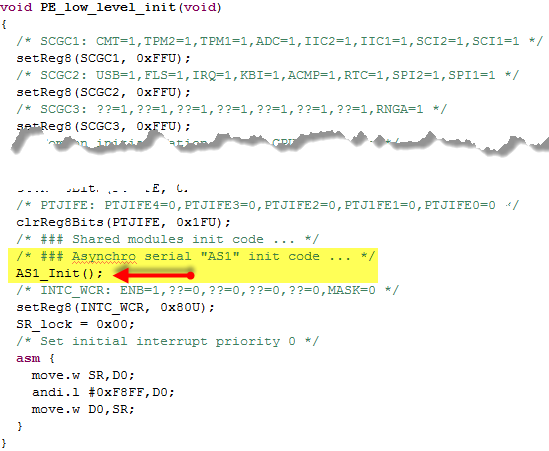 I usually double-click the green event method in above picture and it will jump to the piece of code. I simply could copy that code and past it into my non-Processor Expert project. So I simply need to add the driver vectors to my vector setup. With this, everything should work now. If I’m not interested in a driver, but want to transform the Processor Expert project into a non-Processor Expert one, this is very easy. Because it might be easier to pass a complex project that way to somebody who does not like or know Processor Expert. Or because my licensing configuration includes all the advanced components, but not the person who needs the project. This removes all the Processor Expert related project information, and I have now a non-Processor Expert project. This entry was posted in Building, Processor Expert, Tips & Tricks and tagged Building, CodeWarrior, Eclipse, Embedded Component, Processor Expert, Tips&Tricks by Erich Styger. Bookmark the permalink.